I was relating this info whilst stewarding at Landsdown gallery on the weekend. I am Canadian living in the UK and while doing the Diploma in stitched textiles at East Berkshire college many years ago, used the Art and caribou skin clothing of the Inuit in Baker Lake as my main theme of research and work. I had read in an article in Piecework magazine from the USA about the women in Baker Lake using what was described as a wool/felt material called Stroud to make their colourful naive wallhangings that are still being made today. The co-operative was set up in the 70’s by the Canada Council to encourage Inuit women to continue sewing (the nomadic families were being brought into communities in the 1950’s, 60’s because of severe winters, education for children and malnutrition). There was a concern that they would stop sewing the caribou skin clothes (for hunter husbands) and lose sewing skills (which were evident in the applique and beadwork on their amauti coats.) They thought they would be more attracted to modern winter wear. This did not happen because man made cloth garments were not warm enough. So this co-operative in Baker Lake came about and brought in bolts of felted wool – often very colourful to make the wallhangings that are sold in galleries in many places in N/ America. The women had stories to tell and would applique shapes onto the cloth and add intense embroidery stitch. The dense felted wool material was referred to as Stroud. I had not come across that term of wool fabric, and asked about, when I visited Winnipeg – the curator of the Museum there (it has a huge collection of caribou skin clothing and a large Hudson Bay archive collection) if she knew the term, she did not. But in chatting further, she said that the wool material that originally came to Canada through the Hudson Bay Company for the RCMP red uniforms was a similar wool and perhaps when it arrived and the crates were marked ‘stroud’ the material was called this – the place it came from. I guess similar to way we call vacuum cleaners ‘hoovers’. This seemed to solve the mystery for me. I don’t really know who actually first called it stroud and would think that the uniform material has been sourced elsewhere for many years. There were from the turn of the century plenty of wool and cotton mills in Canada as well. The wood felt today that the women sew with is like a blanket material and very colourful. I expect the end of bolts are donated as they never know what colours they will be working with. The wallhangings are often on a dark background. I would expect they come from somewhere in N. America. I was able to purchase two large wallhangings when I was there. So that is the extent of my knowledge. I spent 3 weeks in two communities in northern Canada some years ago. The women never stopped making caribou skin clothing and they prefer and depend on the animal for everything – meat, skins, sinew. Still today. They may ride around the community in snowmobiles but it is still so cold in the winter -50F that two layers of Caribou skin is the warmest clothing. Grocery stores abound and they can get most all Canadian goods but it is very expensive so mostly caribou and Arctic Char is eaten. 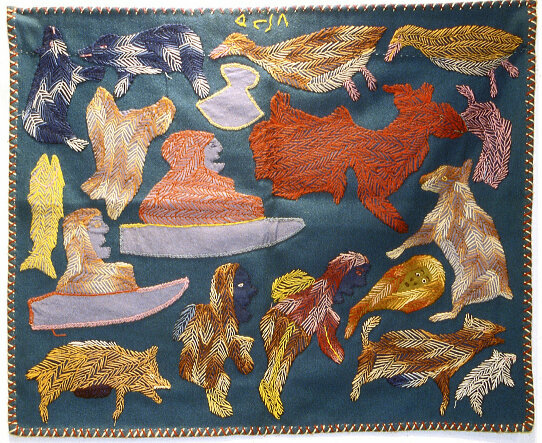 Attached are two images of Inuit wallhangings. The first will have to be nameless as I don’t have the maker’s name. The 2nd is by Irene Avaalaaqiaq and you can google her name and see more pieces. 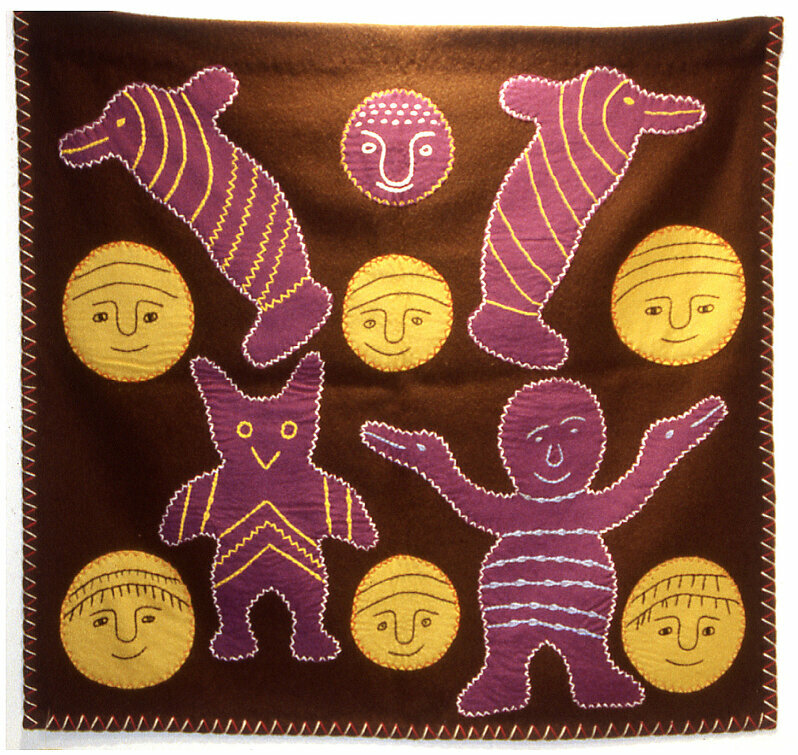 The hangings tell stories – often half man half animal motifs, or a day in the life of a community – animals, hunters etc. I hope the new hangings being produced are still as naive as these were. Some with heavy embroidery stitch – stranded cottons used. I have one of Irene’s and met her (can’t find my images at the moment and they are wrapped up in the attic at the moment). Mine is bright red and white but you can see the ‘red’ in many of her pieces. I don’t know where they source the rolls of wool felt. When I asked the helper, at the co-op in Baker she didn’t know. I am not sure if it is still running, but the women did see it as a way of earning extra money so will be still ‘making’ I am sure. The art/prints and textiles from Baker Lake, Rankin Inlet and other communities is quite sought after in some circles.